Leadership is the timeless practice of guiding others in pursuit of a goal, destination or desired outcome. At the most fundamental level, a leader is someone who motivates, inspires and guides others toward pre-established goals. A leader was once seen as someone who presided from on high, dispensing wisdom, reward and discipline. The historic view of a leader was of someone in command and control who took a strong role in issuing directives and enforcing their execution while remaining at a distance from the daily work. As times have changed, so has the role of a leader. Today's leader is focused on identifying and developing talent while laboring to create a healthy environment that allows individuals to apply their talents and skills in pursuit of key objectives. 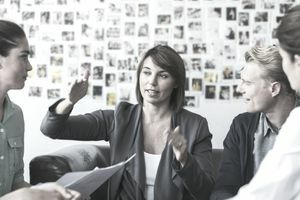 Creating this effective work environment requires that the leader focuses on instilling and reinforcing key values, on modeling proper behaviors, and on instilling a sense of accountability to help teams and work groups succeed with their tasks. Today's leader is in the middle of the action, providing support and ensuring proper direction instead of leading his team from on high. Today's leaders understand the importance of developing and gaining support for team-wide vision. The vision is an idealized state of the future or a future destination that provides context for organizational, departmental and individual goals and activities. The vision might focus on succeeding in certain markets, becoming visible as a leading firm in a market or customer segment, or striving to become the most innovate firm in the industry. Regardless of the actual vision, the leader must create and instill the idea of this destination in the minds of the firm's or team's employees. A clear, strong vision serves as a rallying point for employees. It helps people and teams prioritize investments and improvements. It gives everyone in an organization something to strive for in their daily pursuits. A strategy is a collection of actions organized in a plan to work toward a vision. Leaders are responsible for working with employees, customers, partners, suppliers, and stakeholders to define, implement and execute a strategy that helps the firm succeed in the marketplace. The strategy was addressed annually or bi-annually in days gone by. Today, working on strategy is a continuous process involving a wide array of people and focusing on experimentation and learning. Leaders motivate team members through goal establishment, coaching, feedback and by providing ongoing developmental support. Although money is a component of why everyone works, other intangible factors like rewarding work and the presence of opportunities for professional development are powerful motivators, always assuming that compensation is fair. Effective leaders are constantly on the lookout for ways to tap into the drive and passion of their employees. As you gain experience in supporting and supervising the work of others, challenges will grow in complexity and ambiguity. One consultant describes leadership development as moving outward in a series of concentric circles, with the essential leadership activities at the center and the most challenging work of senior leadership and organizational strategy and development at the far outer rings. Continually seek challenges that move you beyond the known and comfortable areas into new and increasingly complex problems. Great leaders have a remarkable impact on the people they encounter. They're motivated to achieve big things, and they do it by guiding, challenging, and supporting others. The work is challenging and sometimes vexing, but it's remarkably rewarding.